Market Reports on India Provides the Trending Market Research Report on“India Processed Snacks (Savory Snacks) Market in - Outlook to 2022: Market Size, Growth and Forecast Analytics”under Food & Beverage category. The report offers a collection of superior market research, market analysis, competitive intelligence and industry reports. 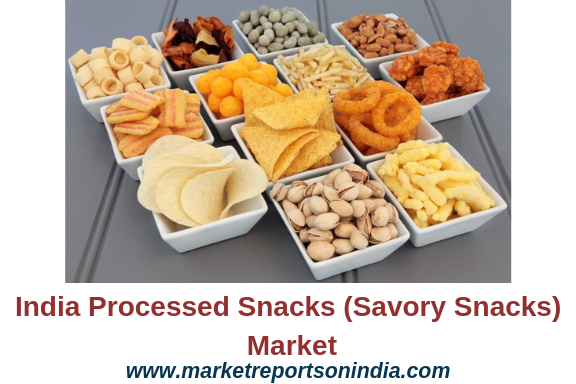 India Processed Snacks (Savory Snacks) Market in - Outlook to 2022: Market Size, Growth and Forecast Analytics is a broad level market review of Processed Snacks market in India.Processed Snacks - includes corn chips, tortilla chips and extruded snacks - i.e. reformed potato snacks. Also includes pork scratchings.Processed Snacks market in India registered a positive compound annual growth rate (CAGR) of 25.77% during the period 2012 to 2017 with a sales value of INR 56,500.15 Million in 2017, an increase of 18.50% over 2016. The market achieved its strongest performance in 2015, when it grew by 28.79% over its previous year and its weakest performance in 2017, when it increased by 18.50% over 2016. The research handbook provides up-to-date market size data for period 2012-2017 and illustrative forecast to 2022 covering key market aspects like Sales Value and Volume for Processed Snacks and its variants Corn Chips, Extruded Snacks, Tortilla Chips & Pork Scratchings.Furthermore, the research handbook details out Sales Value and Volume for top brands for the year 2014 to 2017 and overall market sales by Distribution Channel (Hypermarkets & Supermarkets, Convenience Stores, Department Stores, Dollar Stores, Variety Store, Cash & Carries and Warehouse clubs, eRetailers, Food & Drinks specialists, Drug stores & Pharmacies, Health & Beauty Stores, Other general retailers and others) where ever applicable. - Overall Processed Snacks (Savory Snacks) market value and volume analytics with growth analysis from 2012 to 2022. - Get access to authoritative and granular data on the Processed Snacks (Savory Snacks) market and fill in the gaps in understanding of trends and the components of change behind them.